One of the most controversial moves in the Final Fantasy series was the implementation of Final Fantasy XII’s Gambit system. A good many fans absolutely hated it, saying “the game played itself” or that it “took skill out of the equation.” Those people are called fools, because the Gambit system is the best combat system to come from the mainline Final Fantasy franchise, barring Final Fantasy XI. In traditional, single player Final Fantasy games, there are two types of encounters: Progression and grinding. Battles that advance plot often offer a decent challenge to the player’s party, possibly acting as a wall that will prevent players from progressing the story until their characters are sufficiently beefy. This is how old school games would increase their play times. To break through a progression blocking battle, a typical player will spend a lot of time, possibly most of their time spent playing the game, grinding low class enemies for EXP, Gil, and loot. More often than not, this boils down to mindlessly holding the confirm button until everything dies, then wandering around looking for the next encounter. Truly riveting stuff, who wouldn’t love to spend hours doing that song and dance? Smart people that enjoy the Gambit system, that’s who. 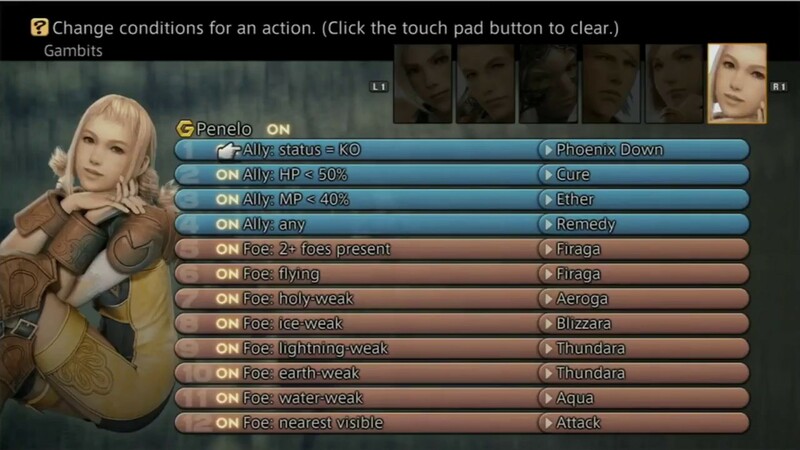 FFXII’s Active Dimension Battle system is made possible by the Gambit system, as it allows the player to control all party members simultaneously. This is done by giving players the ability to program their party members’ situational responses to reflect their own. The Gambit system is the best single player combat management to ever grace an RPG, and it streamlines small scale encounters beautifully. Other RPGs that use real time combat either eschew parties, or have AI controlled party members with specific styles. Yet no matter how well an AI party member is programmed by the developers, it will always fall short of the Gambit system, as it allows players to play the way they want, not how the developers intend. Gambit controlled party members can be customized to fill roles based on player preference, and those roles can be changed on the fly. The Gambit system isn’t the game playing itself, it’s the player teaching their party to take on the player’s personal habits. Reason #2 is my favorite. That trailer may have taken an odd approach, and padded the list a bit with some silly logic, but coming out ahead of the controversial aspect, and establishing it as a positive feature, is a sign of smart marketing. It also doesn’t hurt that the trailer is fairly humorous in nature, further tying a positive response, laughter, to the Gambit system in the audience’s mind. I’ve been waiting for this remaster for a long time, and on July 11, 2017, my hype levels will go nuclear with the release of Final Fantasy Xii: The Zodiac Age. Until then feel free to take to the comments section below and let me know what you think about the Gambit system, and why it’s seriously the best combat system Square Enix has created to date. Totally agree, that combat system has since been my benchmark and sadly nothing came close. I guess it was ahead of its time. That really free up a lot of my RPG character leveling or control and given me a more immersing experience not to mention tying up the zodiac job system giving an extra twist as you can’t be certain your party group will always remain the same as the story progress!! !